This range of practical poultry houses and runs is manufactured to very high standards. 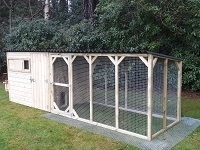 These hens houses and runs are made from treated timber with heavy guage wire mesh and are of the highest quality. In this range you will find chicken and poultry houses suitable for the novice poultry keeper with 2 or 3 hens in the back garden as well as the experienced poultry breeder of rare breed chickens and ducks with a large flock of up to 50 birds. If you are looking for something made to measure then get in touch and we will provide details of our bespoke service of building chicken coops and runs.